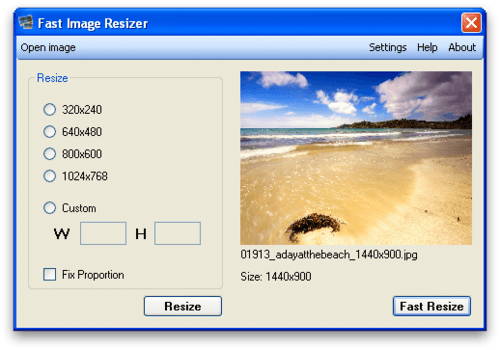 Adionsoft has created the software Fast Image Resizer to assist the user in the edition of his images. They can be easily transferred when their sizes are reduced. Resizing: The software has different size available on the interface and offers the user the possibility to choose from them. For doing so, he just has to select the one he thinks fit, apply it and validate it in the end. Checking: Fast Image Resizer also has a previewing window which enables the user to verify if the modifications that he made have been correctly applied. He still has the chance to change the setting in case of error or dissatisfaction. Editing: Apart from being able to modify the size of images, this program also offers him to change their names. Once the safeguarding is done, he always has the possibility to correct the denomination in the target folder. 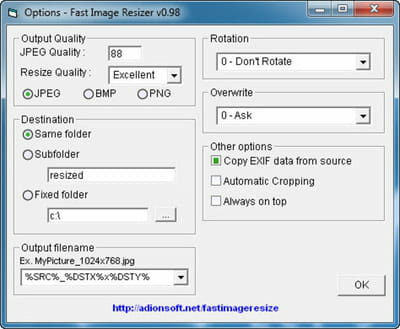 Fast Image Resizer is completely downloadable for free. It is possible to adjust the compression level for the images to be easily transferred via email. Latest update on August 24, 2015 at 01:25 AM.